The qualities of abstract art – painting or sculpture – are often pitted unfavourably against figurative art. Most art that I look at is indeed figurative. If I want to see great art, it will invariably mean going to see historical figurative painting. Of course I enjoy looking at abstract art and could not imagine making anything but abstract painting. Apart from the very occasional, idle foray into figuration – ‘sans le même désespoir’ – I have been at the abstract paint face, so to speak, for the best part of thirty years. I ponder the relationship between these two worlds frequently. What is it about Cézanne and Matisse, or Titian or Goya and so on that makes me continually return to their work – like going to a well for water? There is clearly a chasm in time frames between abstract art and great historical figuration, which is able to call upon a massively larger canon of achievement, casting abstract art in the role of a veritable parvenu by comparison. I once wrote – as a throwaway really – that abstract art must meet the challenges of figurative art on its own terms and not on those of figuration. I wasn’t exactly sure at the time what I meant by that! I was in my studio the other day and those words re-surfaced when considering a few paintings – not in any swaggering challenge to figuration but in terms of what exactly can I achieve in my work? From time to time, like most artists, I sit on a not-quite-comfortable chair gazing dejectedly at my abject offerings to the burgeoning volume of abstract painting as they peer back at me from the walls. Abcrit has thrown up some important areas of discourse since its re-incarnation from Abstract Critical and a chunk of it has helped crystallise feelings about what are areas of concern for me to deal with in my own work too. One issue I feel that has bobbed along like plastic flotsam spoiling the tranquil oceans of literary bias in the visual arts is that of “Space”… the final frontier… This issue has caused such a great deal of debate and even misunderstandings between people; debates which are often akin to watching separate polarities in a two magnets resisting their connection. Space seems at its most ambitious and exciting to behold in figurative painting and sculpture; the reconciliation of three-dimensions on two or the animation of the air as limbs turn through it. What can poor old abstract art offer by comparison? One could say that space is something that has not really been top of the list of achievements in abstract art. Colour has enjoyed some moments in the sun for painting, materiality too, process has played a huge role, as has design. And in abstract sculpture? Everything and the dog next door has “occupied” space – albeit sometimes in beguiling or tasteful ways. Architectonic configurations have offered false dawns as have limb-like assemblages. There is much online tussling over historical precedents, influences, relationships and contexts in sculpture, all of it usually very welcome – especially for younger artists getting to grips with their own work (I have been told this on more than one occasion); heat creates metamorphoses and grit creates pearls. Amidst all this debate and discussion I wanted to point to two moments that have informed my thinking about space. The first was the coffee-fuelled disdain at my own work and a sudden clarification about space in painting; and the other was a quote from Mark Skilton when discussing forging (this I read after I had started this article and it dovetailed nicely with the sentiments I wanted to discuss, so I thought I’d flag it up). Mark mentioned how forging “was compressing the space within the steel, sealing it off from the space around it, isolating the content of the work within the material presence rather than in a spatial presence.” “Sealing it off from the space around it” – just think about that for a moment… I did and it chimed with my studio moment. In fact it helped inform my thinking on figurative space and abstract space and their respective characteristics. Thoughts are never permanent, I know, but at this moment in time, these are hanging around ominously. Figurative space is indeterminate because of its duality. That duality is its virtue. Take a good painting of a landscape for example and that painting does not rely on its physical size to deliver its content as much as its illusory relationship, through rendering, suggestion or even evocation, to a known – external – reality. It could be any size and the pictorial space is not affected. Yes, we have a physically different engagement with larger or smaller works but ultimately the figuration controls the space. My most recent paintings are around 6 x 4 ft in proportion. I have been on this size for over a year now and I started to realise, whilst considering how the colour was working, the implications for space. Space is not something I go looking for, to be honest; articulating colour means things happen that I can’t predict and spaces occur through these ‘happenings’. I can’t pre-determine a defined space in my paintings. What dawned on me was that all the space I could deliver in these paintings, would be up to twenty-four square feet – any suggestion of “more” and I would say it was “leaking” and dissipating in impact; any less and it’s compromised in its delivery. My paintings have to deliver the amount of space that they occupy. That yellow is there, that blue is there, they may do “something” together as all my colours try to, but all this “something” will amount to and can amount to in these works, is – if I’m lucky – twenty-four square feet. I have also written about how abstract art can provide a “haptic sense of space”, but I now realise that abstract pictorial space has a size limitation too, yet it is one which is not necessarily limited in expression. Maximise the space on offer and that will be considerable; one does not have to try to suggest more. Abstract paintings often leave the space in an indeterminate state – perhaps paint-marks existing as the non-essential, tasteful detritus of the painting activity, washes which could be liminal spaces from vistas, frenzied splashes as signifiers of earnest ambition; it can often add up to somewhere else rather than what’s really in front of our eyes. Furthermore, this indeterminateness is often celebrated as being “evocative” – some sort of numinous experience can be had by looking “in” to this mysterious hinterland of the visual. Indeterminate space in abstract art is a benign, non-threatening space; a space where our egos love to roam – probably explaining how prickly or even intimidatory things become when it’s discussed. Many artists are often turned off by this type of discussion; those of a shy temperament perhaps. I for one will say to those people: Please contribute, debate, argue or disagree where you see fit to… park your ego at the door. Thinking about abstract sculpture: Figuration in sculpture could be said to have been replaced often in its content by ‘tastefully’ chosen bits of steel. This has been abstract sculpture’s way of competing with the complexities of figuration – configure some interesting components, maybe even refer to something figurative – a hook to lure one in on. Many sculptors do this – make sculptures that rely upon juicy forms in an artful repose which have the feel of figurative, sculptural space about them. Sometimes it can be eye-catching and I would point out that I have no problem with this as a way of working (or any other personal “style” – artists are hardly the bad guys) if that is what interests you, Nor am I opposed to any sort figurative painting made today (I would even admit readily to Basquiat being a guilty pleasure) but, I need to echo Mark’s words here again – “the space is sealed off”. It becomes indeterminate (perhaps this is why maquettes are required for public sculpture – not just for costings or commissioning juries but for everyone to control the space rather than hand it over to the sculptor to deal with as an integral element of the decision-making – that leap of faith would never pass the committee stage would it?). I can enjoy looking at abstracted, suggestive, filmic or designed painting as much as the next person but with the hefty caveat that they are ultimately “compromised” as an art-form, therefore none of it is something that would overly concern or challenge me when I am in my own studio. Furthermore, I believe that there is in fact a difference between figurative and abstract art. I do not agree it is only about being “good”. I respect the words of many who say this, but these words – again – are not going to help me in my studio. I take it for granted that I am trying to make things that are good, we all are – who isn’t? (There are some, so don’t answer that, it just induces sighs.) Is that ambition enough though… really? Returning to the figurative art I prize the highest and taking Cézanne as a prime example: Although the spaces he makes are figurative, it is highly relevant that the main criticism about his work has been its lack of ‘atmosphere’ – in the traditional sense. 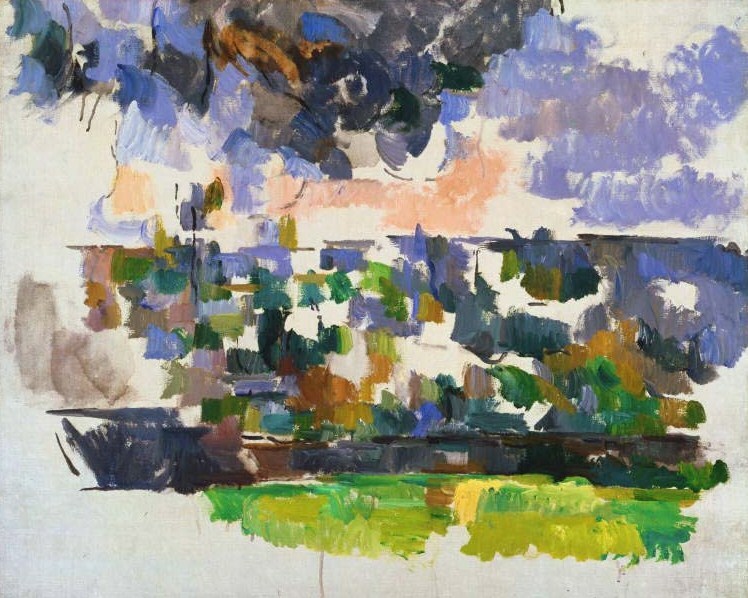 No landscape was ever “captured” by Cézanne; instead one is constructed, synthesised, and in this synthesis, every stroke is really there as an autonomous reality. This lack of atmosphere is actually a lack of “leakage”. A painting ends at its limits and everything is contained by those limits. Yet what of a sculpture? Where does the space end in an abstract sculpture? “Assemblage” characterises a significant amount of abstract sculpture. It is collagic in nature: pieces are joined through welds or glues. These pieces are usually found or formed and ‘brought in’ to the work. As such there will be spaces to deal with. How much abstract sculpture shuts out the issue of space, though, preferring to explore issues of form and materiality? In this modus, abstract sculpture would seem to be operating within the shadows of figurative art, which by stark comparison has an endless ‘library’ of forms to work with. As I said, getting tasty pieces of steel was one way of challenging this library – the truth is that it often ends up appearing as a second-hand bookstore by comparison; nice to browse in from time to time perhaps. Beautiful objects were another incentive to make abstract sculpture. Post Caro, our highest profile sculptors produce “interesting” three-dimensional objects or figures rather than really challenging sculpture. An object has a poetry ready and waiting to come out; it yearns for its own history, like the long-serving French President Mitterrand did on the day of his inauguration. He walked amongst the Parisian tombs of the greats of the past – at once wanting the world to see that he could and would be identified as one of them. A solemnity was what he desired. He had one eye on his death before he even took office. Great figurative art is apprehended with that same solemnity. Artists often go looking for it too. It becomes a search for a content that can be discussed independently between artist and viewer over a glass of wine at someone else’s show. Yet you can’t discuss space as easily – no matter how much alcohol is present. Space is invariably the thing that we move through to look at most sculpture rather than the stuff we engage with, when we get there. As a painter, I do not have to face the challenges of the competing, enclosing space of the room, gallery or environment in such an intrusive way as a sculptor does. A sculptor will have to make a sculpture that negates that space unless they are ‘installing’ a work which obviously has to exist in a dialogue with it. I have looked at quite a bit of sculpture in recent years and much of it I find hugely challenging. One thing in particular that I enjoy is the specificity that a good sculpture has. I am also intrigued by the point at which the space stops being active. Is this in some way proportionate to the internal spaces and ultimately conditioned by the intrinsic nature of the material itself? In short you can’t make more space than you have material to make it with. If this is so, wouldn’t scale be of paramount importance? (scale is another thing that obsesses me). Scale in sculpture would come from the inter-relational dialogues of the component parts and their consequential air-spaces. A repeated size of parts has the problem of limiting the scale and making the sculpture seem small; too big a contrast and the space ruptures. It’s a fine balancing act (in painting too). Putting larger elements in and integrating them in a sculpture can provide a potentially stronger spatial facility and thus a more potently expressive work. We look in admiration at the way performers command the stage. They have a confidence in their own abilities to perform due to much rehearsal and sweat which ensures that high level of performance; it’s all about confidence rather than bravado. Bravado feels more at home on our screens these days. The virtual space of the screen is forgiving and quite benevolent towards images of artwork which have wildly differing visual qualities – levelling them out as experiences, whilst providing little or no feel for their spatial realities. Good paintings often suffer a death through glass in this way. Spare a thought for sculpture though, as three-dimensional space is a contradiction in terms to a screen image. Sculptures degrade to approximated illusions on screens. Advanced eyes are adept at patching up these shortfalls… to an extent; looking forwards not back, seeing possibilities, rather than contexts. It takes a degree of education to fully understand context, yet we live in a pernicious age for education, we are seeing the rise of contextual ghettos: Those who can appear to “get it”, and those who are regarded as “making do”. Woody Allen once said “life doesn’t imitate art, it imitates bad television”. Looking forwards means grasping the implications for space as a set of problems and opportunities rather than just a way of re-confirming prior experiences – new covers for the same old chairs. It is fine to flaunt a contextual understanding but clean fingernails don’t make civilised populations. A conspiracy theorist would point to the savagery that exists in funding for the creative arts or languages as part of an engineering of society to disengage from any meaningful questioning of the status quo. I have no answers to the dilemma of screen imagery, other than to be more and more demanding of surface and colour in my own studio, for I feel I can only discover space through these elements – the kind of space which will reveal itself to me, I have no idea of. Considering space as a palpable entity to be discovered rather than something to be pre-determined, suggested or alluded to forces me to bear down on the realities of my decision-making and I hope any space made through these elements would have an energy about it. This kind of space would probably be all the space I would need. Space in painting and sculpture is mysterious, it appears where and when we least expect it and greets us in our silences as we sip our coffees and stare into somewhere in front of us. ← #78. Tim Scott writes on his new sculptures. I don’t concur with all of this essay, but as editor of Abcrit I must comment on how welcome it is. Written by a very serious abstract artists about some of their own practical and theoretical dilemmas, it pitches in at a place very central to where I see Abcrit operating best. More like this, please. Many thanks Emyr. I’ll no doubt get round to disagreeing later. I think I am still confused about ‘space’ in abstract painting, I get it when applied to abstract sculpture, but it would be really helpful if you could do your thing Emyr, and post a painting that you felt operated spacially and one that didn’t. Ps I meant to say I found your essay really well written, it’s just my personal difficulty understanding abstract space. Reading the discussion between Harry Hay and Simon Gardam they talk about ‘feeling’ space in abstract painting which actually resonates and could help to experience space as abstract rather than figurative when looking at abstract painting. Seeing space as an emotional response, like Simon suggests, could be something that works. Some paintings definitely have an aerial feel but if we accept that as a feeling rather than a figurative truth, it can be abstract. That’s an interesting notion, Noela, that space is about a feeling. But I don’t trust the idea, and in the end I wonder if we should just write off space in abstract painting. It’s come to be crucial and important in abstract sculpture recently, where it by no means comes easily or naturally, and where “objecthood” defeats it. But the fact that, as Harry has said, the natural condition of all painting is spatial, no matter what, means somehow that the “depiction” of space is problematic or maybe redundant. Maybe abstract painting should be involved with something else? Maybe abstract painting should discover something new? See my comments on Anne Smart’s painting on Brancaster. Also, I keep looking at Sarah’s patchworks (they are not really quilts) and thinking they are fantastically visual and “sort of” pictorial, but not spatial. I feel a little bit the same about John Bunker’s collages. What does this mean? I don’t mind admitting that, like Noela, I’m confused. That’s space AND light in abstract painting I’m confused about. I think space as a feeling is on the right track. Painting (whether figurative or abstract) enables/obliges us to experience space as a subjective quality rather than an objective quantity. You can´t measure the space in a painting, just as you can´t measure the subjective space in a sculpture that transcends objecthood. We´re used to space as the quantifiable construction that contains the world in our rational/causal explanation of it. (With the help of geometry, the space of photos and mirror-images can also be subsumed into this rational account of the world.) But before our rationality converts it into a measurable system of coordinates, space is a QUALITY of subjective existence, which can be felt/experienced but not quantified. I think that, in this way, the spatial properties of visual art (and especially abstract visual art) can help to put us back in touch with the immediate, qualitative nature of existence. Yes good. I recall what you said about John Pollard’s works – that the whole thing might feel spatial without any of the components falling back individually. So a naturalistic kind of space is replaced by a more overall feeling of spatiality? But that may link to what I am saying about how Anne Smart’s painting are made, rather than the spatial effect of their outcome. My hunch is that any tension or pressure in abstract painting may come more from that quarter – the mindset of how they are constructed – rather than the reconcilliation of three-dimensions in two that you get with good figurative painting. Do you mean by “the mindset of how they are constructed” a particular “look” which the artist is going for without further analysis? I would agree with that, and that any attempt to capture the “look” in words is bound to fall short, or reduce it to its conventional aspects. That said, I think that there are things going on in Anne´s paintings that are unusual and original even within a conventional (and linguistically accessible) framework of space and surface. I think maybe the opposite of a “look”, more of an application of some undefined principle to how the work is made, that steers clear of conventional aesthetics or formalism. This seems to me a rare thing in abstract art, and we may have to wait for the principle to be revealed by the work, rather than the work be directed by the principle. Space of course doesn’t end in abstract sculpture, but the specific “spatiality” of each particular sculpture has its limitations, those being at the point when it loses its close “conversation” with the material; and this is why advanced abstract sculpture at the moment has to some extent withdrawn extensions and cantilevers out into space, since they would (over)stretch our capacity (at the moment) to include such forays. This is counter-intuitive in some ways, because the natural thought of how to make sculpture more spatial is to extend it out into space. But the space encompassed is merely literal or perhaps architectural – like in a typical sixties Caro – and this, we now realise, is very different from a true and complete spaciality in and through the whole work. As for the “collagic” nature of constructed or assembled sculpture, I think two things: Firstly, that “collagic” applies to things pictorial more than three-dimensional (see Caro again); secondly, that if the spatiality is developed enough, then any tendency to appear collagic is overridden by the unification of space and material. “Collagic” in regards to the steel being lots of bits accumulated into a whole but still observable as bits – I am not implying any pictorial connection in the modus operandi and my use of the word; yes it must ultimately transcend its parts. Space cannot be quantified, agreed- not what I am trying to say – perhaps badly – but dealing with the “instances” of every colour throughout the whole painting, or every piece in the sculpture and keeping your eye on these facts and not drifting into the fictions that throw themselves at you (which ‘is’ to pictorialise them) What space occurs will be as a result of these maximised colour / piece instances – making them react to and against each other. This is what I am trying to get at. (I wonder if emptying out means excuses flood in too.) But returning to the word – avoiding pictorialising is perhaps the issue. How to do this is a moot point. Processes or neutralised layouts or minimalism have all been approaches that seemed to find other ways of making things happen, but they have ended up – for me – a bit like watching a single synchronised swimmer.